We are familiar with the Shanghai skylines, its towers, its architectural style that developed in the 1930s and its unparalleled urban transformations. Quite contrarily, we know far less about the intimate daily interactions between humans and built spaces, individual or shared, the kind of spaces that also unveil transformations, adaptations, evolutions in which the inhabitants take part. Liz Hingley and Jeremy Cheval have explored and studied these very intimate spaces. While Hingley captured them through her informed lens, Cheval dedicated a research on social and spatial transformations in Shikumen, this traditional Shanghainese urban fabric peculiar to its inhabitants and their lifestyles. Marine Cabos-Brullé, art historian, research associate at SOAS and EHESS; Liz Hingley, anthropologist and photographer, currently research fellow at University College London; Jérémy Cheval, HMONP architect and PhD in architecture. Moderator: Françoise Ged, head of the Observatoire de l’architecture de la Chine contemporaine, Cité de l’architecture et du patrimoine. A fang sheng gathering at Shanghai ferry port, January 2015 © Liz Hingley. 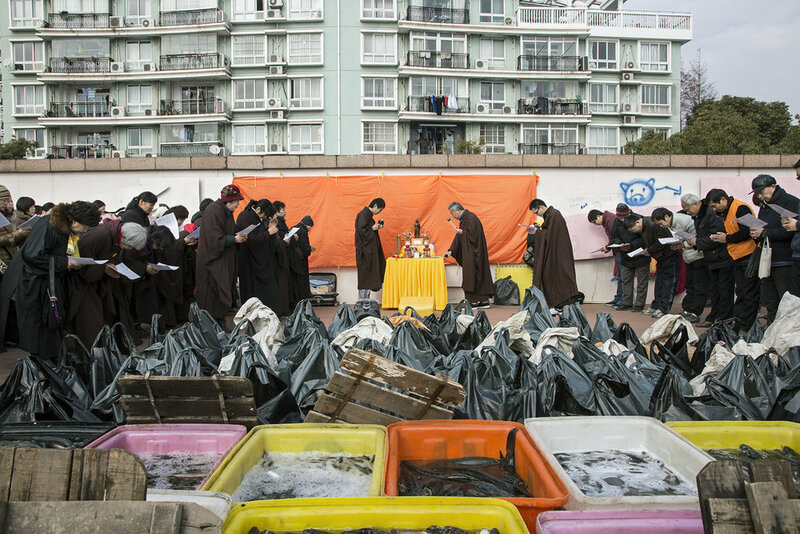 A number of Buddhist networks gather donations for the Buddhist practice of animal release and perform the traditional ritual on the various waterways that cross Shanghai.